It is recommended that you use one of Apple's supported methods for backing up your device. You can also manually backup your boards for safe keeping in case they are deleted accidentally or your device is lost or damaged. 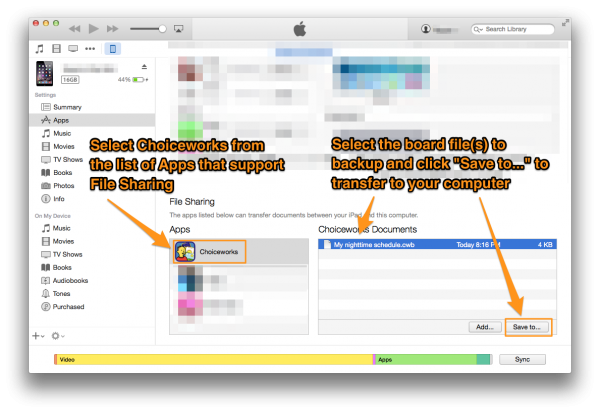 The method of backup described here uses iTunes File Sharing, which allows you to share files between the Choiceworks App and your computer by connecting your device to iTunes. 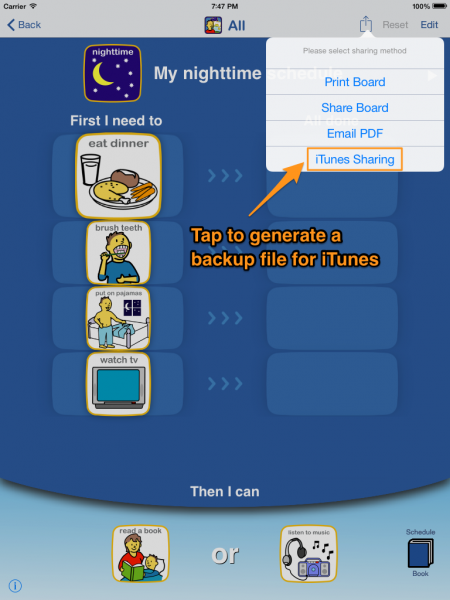 Tap on the "iTunes Sharing" option to generate a backup file. The file will be saved to your device and will be downloaded in the subsequent steps. Repeat this step for each board that you want to backup. Select your device in the iTunes. Get help if you can't find it. Click Apps in the list on the left and scroll down to the bottom to view the "File Sharing" section. From here you can select the board file that you want to download to your computer. Once copied, you can put them somewhere for safe keeping. If you need to restore any boards from your backup file, use the File Sharing screen in iTunes (see Step 2 above) to "Add" the file(s) to your device. Once the files are all transferred to your device, open the Choiceworks app and launch the "Import Boards" menu from the settings panel. 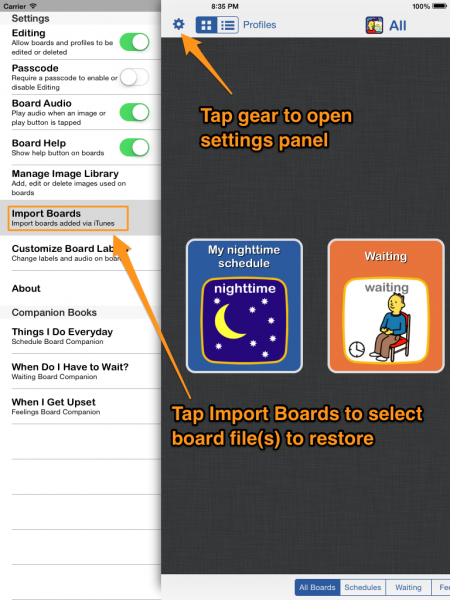 From here you can tap to import the boards using the files you just transferred.